A group of African Pygmies hunt a hippopotamus and a crocodile on the banks of the river Nile. One Pygmy stands on the back of the hippo driving a spear into its rump. Two more stand in a fishing-boat before the beast--one is devoured and the other raises his arms in panic. Of the four Pygmies capturing the crocodile, three stand on the shore holding ropes while a fourth sits on its back binding it with the other end. 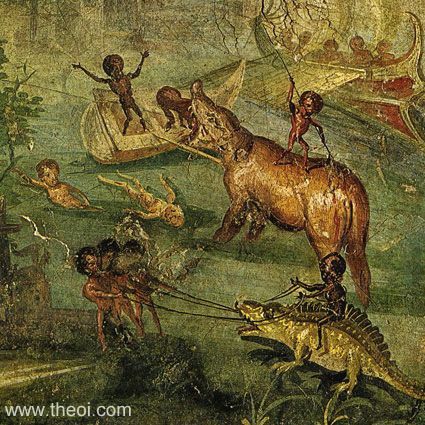 The two white "Pygmies" swimming in the water are perhaps Carpi (Fruits), demigods associated with the river Nile. In the far background, a third group of Pygmies man the oars of a river barge.